Let's keep this a positive and supportive community for fans of Australian Shepherds, related breeds, Miniature Australian Shepherds, North American Shepherds and mixes. We understand that there are divisive positions related to these topics, but for the purposes of this page and website let's keep the focus on common ways we can share our enthusiasm for the dogs we love. Aussie vs. Mini Aussie vs. Mini American Shepherd. Before we begin any discussion about the Australian Shepherd or Miniature Australian Shepherd or Miniature American Shepherd I would like to make clear that they are classified as separate breeds. This site is about providing accurate information about these breeds which, although they do share a common history, are now distinct and separate. The Australian Shepherd is recognized by the American Kennel Club (AKC) and the Australian Shepherd Club of America (ASCA). 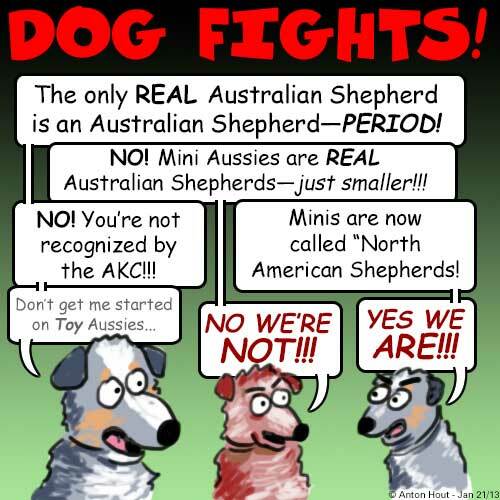 Neither of these organizations recognize a miniature (or toy) variety as part of the Australian Shepherd breed. The Miniature Australian Shepherd is considered a separate breed from the Australian Shepherd and the Miniature American Shepherd is considered a separate breed from both of them. A simialar schism has developed between the Miniature Australian Shepherd and the AKC recognized Miniature American Shepherd. I strongly advise due diligence in investigating both the breed and the breeder to make sure you choose the right dog for you. The Miniature Australian Shepherd, North American Shepherd, North American Miniature Australian Shepherd, and/or Toy Australian Shepherd breeds are not recognized as a variety of Australian Shepherd by ASCA. The club considers such dogs to be a distinct and separate breed and will not accept them into its registry. "Our bylaws state that ASCA purpose is: 'To encourage members and breeders to accept one breed standard for the Australian Shepherd as approved by the Club as the only standard of excellence by which Australian Shepherds shall be judged.' It is the mission of this club and the mission of its members to preserve the breed rather than change it." 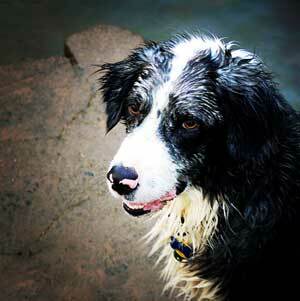 Aussie Clay cools off at the river. The question of the status of the Miniature Australian Shepherd and Miniature American Shepherd can be a hot-button issue for many. This is especially true when confusion about the relationship of these breeds is promulgated. For example, use of the phrase "Standard Australian Shepherd" serves to create the impression that the Aussie is the "standard" size and that the Mini is just a "miniature" size variation of one breed called the Australian Shepherd. This is misleading. The remedy for this situation is not animosity, it is education; not confusion but clarification. 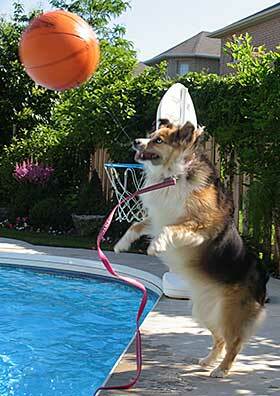 Originally the official Australian Shepherd registry was the National Stock Dog Registry (NSDR). The ASCA took over this function in the 1970's. In fact the current breed description wasn't written until 1977. As the Australian Shepherd had been bred to be a working stock dog ASCA decided against joining the AKC as they felt too much emphasis was placed on conformity to breed standards and not enough on performance. Those who sought AKC recognition created the United States Australian Shepherd Association (USASA). They developed their own breed standard and the Australian Shepherd was officially recognized as a breed by the AKC on January 1, 1993. A miniature variety, however, was never part of the development of the Australian Shepherd breed. Miniature varieties are not recognized by ASCA, USASA or AKC. These organizations do recognize Australian Shepherds who are smaller than the breed standard — so long as they are not called or registered with other organizations as "Miniature". As far as these organizations are concerned they are just small Australian Shepherds. If these "small Aussies" are registered as "Miniatures" they are effectively shunned and lose their breedhood (is there such a word?) and are no longer considered to be Australian Shepherds. For example if such a dog was registered with ASCA and was then also registered as a Mini, ASCA would revoke its papers. Although Minis are not recognized by ASCA, USASA or AKC, they can be registered with the American Rare Breeds Association (ARBA). A parent club for Minis was created in 1990. Originally called the Miniature Australian Shepherd Club of the USA (MASCUSA) its name was later changed to North American Miniature Australian Shepherd Club of the USA (NAMASCUSA). This name change occured after the Australian Shepherd was recognized by the AKC and ARBA had a policy of not allowing dogs to show with them who had the same name as an AKC recognized breed. This is when the Miniature Australian Shepherd became the North American Miniature Australian Shepherd. One can understand the desire of Mini breeders to maintain a link with the Aussie legacy but keeping "Australian Shepherd" as part of the name has contributed to the continuing confusion about the relationship of Australian Shepherds and Miniatures. Also contributing to concerns about Minis are the health issues that can arise from seeking to breed down in size. Selectively breeding the smallest of the litter, or runt, could introduce a greater tendency toward health problems. A practice I've heard of that I find disconcerting is cross-breeding Australian Shepherds and Minis with completely different smaller breeds to get the size down and then re-crossing them back with Aussies to get an "Aussie look" back. Of course such a dog would in reality no longer be a Miniature Australian Shepherd let alone an Aussie. It would just be a mutt. Unfortunately, when such stories come to light reputable breeders can often be tarred with the same brush and unfairly fall under a cloud of suspicion. This again serves to keep the Aussie vs. Mini debate simmering. Of course, shady backyard breeders plague Aussie breeders as well. However, a review of CERF and OFA data reveals that the Miniature does not suffer from adverse health conditions in comparison to the Australian Shepherd. In fact, the two populations have approximately equal occurrences of the same health issues. Also due to the natural variation in size it is not necessary (or desireable) to use runts in breeding programs. Historically, the Australian Shepherd is an amalgam of herding breeds that were present in the American Old West. Some of these contributing breeds were small as compared to the contemporaneous Australian Shepherd. Some of these breeds were large in comparison. In the early to mid 1960’s when the Miniature was originally developed, there was very little size consistency in the Australian Shepherd breed. Remember, that at this point there was not even an official breed standard for the Australian Shepherd! In any litter of Aussie puppies, some could be smaller and some larger, not due to health issues, but due to the genetic influence of these varied foundation breeds. Common sense tells us that a population of dogs as large as that of the Miniature Australian Shepherd could never have survived, let alone flourish if its foundation and ongoing development was limited to weak, unthrifty, unhealthy dogs. Further evidence may be presented that a dog that is small due to poor health would genetically reproduce offspring larger than itself. Thus, developing an entire sub-population of smaller dogs (that number in the thousands) could not have been successful using small dogs whose genetics produced larger dogs. Apache Wee Maiden (front) and Cheyenne Autumn are female Miniature Australian Shepherds. The Australian Shepherd was originally registered with NSDR in 1956 (IESR at the time) with no varieties. 12 years later, in 1968 the NSDR accepted its first Miniature Australian Shepherd into the AS registry. That dog was the offspring of two NSDR registered AS. NSDR assigns a registration prefix of "A" to dogs registered as AS and "MA" to those registered as MAS. Since 1968 NSDR has registered the MAS as a variety in that an "A" dog whose adult height is less than 18" can be reassigned a registration to "MA". By the same token, an "MA" dog whose adult height is over 18" can be reassigned a registration to "A". This practice was established years before ASCA was formed and before ASCA began their registry and continues to this day. This is the historic basis for those who believe that the MAS are and should be considered by all organizations to be a genetic variation of the Australian Shepherd. 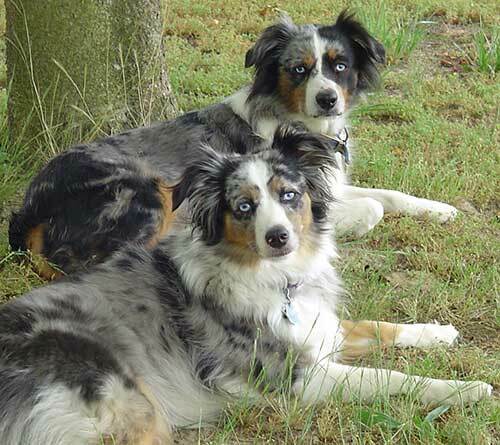 MASCUSA (now NAMASCUSA) was formed in the late 1980's to provide a parent club for those focusing on producing Miniature Australian Shepherds. Initially MASCUSA adopted the same registration policies as NSDR concerning parentage of their registered miniatures, but within a few years revised the registration policy to require that at least one parent be a registered miniature with either NSDR or with MASCUSA, while allowing that the other parent may be an ASCA or NSDR registered Australian Shepherd. This change was instituted in order to achieve better size consistency in the miniatures being produced. AKC Australian Shepherds were included in this policy when acceptance to that registry was gained by the Australian Shepherd. Those who would accept that the Miniature Australian Shepherd is a separate breed point out that a genetic separation began to occur at the point that one or both parent(s) was required to be a miniature in that the Miniature lines now concentrate on a specific sub-population of the Australian Shepherd. All Australian Shepherds and Miniature Australian Shepherds trace back to the original NSDR registry. These breeds have a great deal in common and much of this site is relevant to owners and breeders of either (or both). The differences won't be resolved here but I feel it is important to maintain this as a positive and inclusive resource to help owners and breeders, and most of all to provide information and education for the public about both Aussies and Mini Aussies. This is why it is so important to research which breed and which breeder is right for you. Don't take shortcuts. You will be living with the consequences of your decision for many years. What Breed Is Your Aussie – Really? It's not always 100% sure what breed your dog is. If you would like to fiind out it is now possible to genetically determine the ancestry of the parents, grandparents and even great-grandparents. 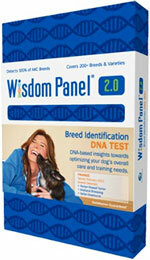 It's easy to do with the Wisdom Panel Dog DNA Kit. Basically, you collect samples from inside your dog's cheek, mail back the postage-paid envelope and find out your dog's ancestry. The results are e-mailed to you within 2-3 weeks.